I was given the chance to try out Walgreen's Brand Health and Wellness products! 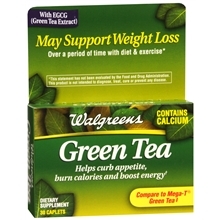 I chose to try the Walgreens Brand Green Tea Dietary Supplement. Walgreens Brand Health & Wellness Products all include the same active ingredient that you would find in any other brand of the same type of product. I have never taken a green tea supplement before, but I found that while taking Walgreens Brand Green Tea Dietary Supplement that I had more energy than normal. I didn't notice weight loss, but I did feel great! The pills were rather large, but when I took them with a glass of milk they went down easily enough, and they didn't leave a bad taste in my mouth like some pills! I personally think that is a major factor when choosing a product to take. Walgreens also helps out the community. The purchase of every Walgreens Brand Health & Wellness Product supports bringing preventive wellness services to local communities through the Walgreens Way to Well Fund™. Walgreens will contribute up to $3 Million to the Way to Well Fund each year! The Walgreens Way to Well Fund™ will provide free preventive health tests as well as other health and wellness services and education to local communities. Some of those services will include preventive health tests through the National Urban League Health & Wellness Tour and vouchers redeemable in select stores.